The moment you press your foot on your brake pedal to slow your car down is when you need to feel the most confident that the parts involved in stopping your car safely and in time are working properly. So it’s not the time when you want to hear any untoward noises or feel any unexpected sensations, such as a grinding or squealing, or a juddering as the vehicle slows down. But what causes brake judder? In a broad sense, brake judder is caused by vibration. When this happens, it passes up from the brakes, through the suspension, and on upwards into the steering wheel, potentially resulting in a violent judder. This effect is likely to create a reflex reaction forcing you to grip the steering wheel tighter. For this reason, experiencing brake judder at high speed can be particularly disconcerting. But fear not - knowing the symptoms and cause of the problem will help you greatly when it comes to getting it fixed - so MyCarNeedsA.com brings you a comprehensive guide to brake judder causes, and will then tell you what you need to do to get it fixed. There are three main brake judder causes, all of which can be pretty easily remedied - but it helps if you first know the sometimes subtle differences between them. This happens when a disc is improperly fitted in the first place, causing it to pull out of line with the hub or caliper, the two other parts with which it comes into regular contact. Rust or dirt accumulation on the surface of the wheel hub: This weakens the contact between the brake disc and wheel hub (where it’s most important). Distortion of the contact surface on the wheel hub: This usually occurs when the screw used to attach the disc has been over-tightened. Eventually it may lead to constant vibrations whenever the brakes are applied. Distortion of the wheel hub: While this is rare, if an attempt is made to attach a disc to a warped hub, this will create vibration, just as if any rust on the hub surface isn’t cleaned off before a disc is fitted. This has become an increasing problem in recent years with the greater prevalence of alloy wheels. When a tyre is replaced, using location spacers on the spigots of the wheel, a lost spacer makes it very difficult, if not impossible, to centre the wheel on the axle mount. A specialist tool known as a run-out gauge can be used to measure any tiny gaps - which can be tenths or hundredths of a millimetre - between the parts of a pad and disc which come into contact. These tiny gaps can be eliminated by removing and refitting the disc - but patience and perseverance may be needed as run-out can only be detected with the wheel fitted, so this might have to be done a few times before the gap is found and properly dealt with. Whenever you bring two surfaces into contact when at least one of them is moving at high speed, the result will be friction. This friction then creates heat, and when this is transmitted through to other parts of a car’s braking system, the ‘hot spots’ which are created cause poor contact between the brake pad and disc - and another reason for that juddering feel. Brake overuse and abuse: The most common cause of overheating - while brakes are designed to withstand high temperatures, and to be able to cool down quickly when they aren’t being used, if you hit them hard several times in quick succession, this can cause a phenomenon known as ‘brake fade’, which is caused when the hoses carrying hydraulic fluid through your braking system expand, and so the pressure which the fluid can exert to help slow you down is reduced. Repeated heavy use of your front brakes might also eventually cause blue scorch marks on the brake discs - as well as a telltale burning smell! Once these marks appear it means the disc has been permanently damaged and will need to be replaced. Use of cheap, poorer quality brake pads: This can turn out to be a false economy, as some lower-quality pads are more prone to overheating, due to not having been made from the best materials. As with heavily-used brakes, those blue scorch marks will be a giveaway sign, which shouldn’t be ignored. As a set of brake discs and pads accumulate higher mileages, it’s possible that some parts wear down more quickly than others. Optimal braking force requires the discs and pads to be the same thickness throughout - but in day-to-day driving this is practically impossible. You can help reduce the chances of this occurring from the very first time you drive your car after it has had new pads fitted, by being sure to only apply the brakes gently on the first few occasions when you use them. This can help ensure that all parts of the disc get coated with a roughly even amount of the friction material which is essential for them to do their job properly. We suggest that you should try to avoid harsh brake applications for the first 120 miles or so, as this will help new discs and pads to bed in. Either of these can lead to seizure of the brake caliper piston, which in turn brings about uneven wear due to the disparity in the forces being applied on either side of the brake disc. Deposits of this kind may throw a disc out of kilter, so causing that uneven brake application sensation as already mentioned. Small variations in thickness between discs can be treated by brushing or sandpapering off any loose deposits. A short road test will then establish whether the problem has been solved and the discs are again working in proper alignment. 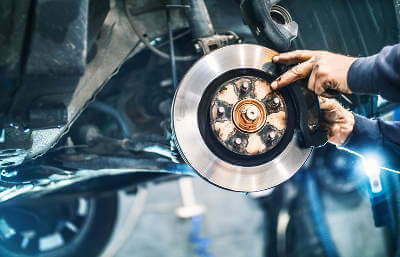 This can easily lead to an imprint of the brake pad being formed on the disc, and if the pads are hot, could even deposit specks of pad material onto the disc surface. Again, a simple brush should suffice for removing all the excess debris, but if this has built up appreciably, it might be better treated by gentle rubbing with sandpaper. Brake pads generally have a lifespan of a couple of years according to the AA. And because of the variations in the circumstances in and degrees with which front and rear brakes are used, the reasons for this can also be different. A lightly-used car which is always kept in a garage between outings is far more prone to developing corrosion of parts of the braking system than a car which is driven daily and parked in the open. This is because the warm, often humid conditions which prevail in a garage make it easier for condensation to develop, and in turn for this to lie around, and eventually cause those rust spots. But because the brake pads and discs at the front of the car take a disproportionate amount of the load when a car is being brought to a halt, these can wear far more quickly than those at the rear. How Often Should I Expect To Have To Change My Brake Pads? There’s no hard and fast rule for this, but again, your regular driving conditions will have some bearing. But when it’s quite feasible for one set of pads to last for 70,000 miles and another to only have a lifespan of about 25,000, it’s virtually impossible to put a hard figure on it. The type of vehicle, your driving style, and the distance covered on individual journeys all have a significant bearing on pad wear. But at the same time, braking frequently from low speeds doesn’t cause as much wear as slowing down rapidly from higher speeds, such as when you’re driving on a motorway. The banning of the use of asbestos in brake pads and shoes in 1999 has also resulted in the introduction of less harmful materials to provide the friction surfaces of brakes. Initially, these asbestos-replacing substances were much more harsh on the discs themselves, causing more rapid wear - but subsequent advances have helped reduce this problem according to the AA. Your new brake judder fix, in the form of some spongy, grippy new brake pads, also need time to bed in. As a result, as we mentioned earlier, it’s wise to try to avoid harsh braking for an initial period after having had new pads fitted - but after about 50 miles you should be clear to put them to their full use. If you regularly park on a steep hill, you might also find that your rear brake pads wear more quickly than average, because of the car’s handbrake needing to be more fully engaged to hold the car. This could lead to the problem of imprints appearing on areas of the pads which are most often kept in contact with the wheel rims whenever the handbrake is engaged. If your car shudders when braking, it isn’t only a sign that some part of the system needs attention - it can also be a symptom of troubles with connected parts of the car, such as damaged inner wheel rims. So it’s important that you have your brakes examined as soon as you can. That might uncover any of the problems mentioned in this article - but more importantly, getting to the bottom of what causes brake judder, and having your brakes examined by an expert mechanic, and then all the component parts adjusted and/or replaced as necessary, can make the difference between you being able to stop your car in a controlled manner, and hopefully in a straight line, when you absolutely need to. Don’t ignore brake judder - it’s a clear sign that something is or might be about to go seriously wrong with your vehicle’s braking system. Enter details of your problem to start getting brake repair or brake replacement quotes from garages in your area, and put yourself on the fast track to a solution. Need pads, discs or shoes? Get quotes today?